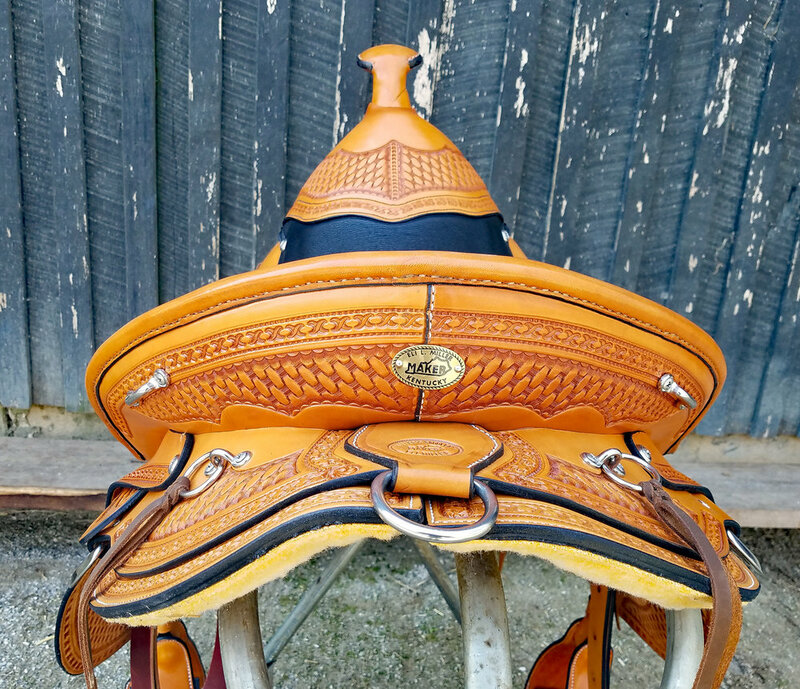 This is a Genuine Eli Miller Custom Made Buena Vista Plantation Saddle. 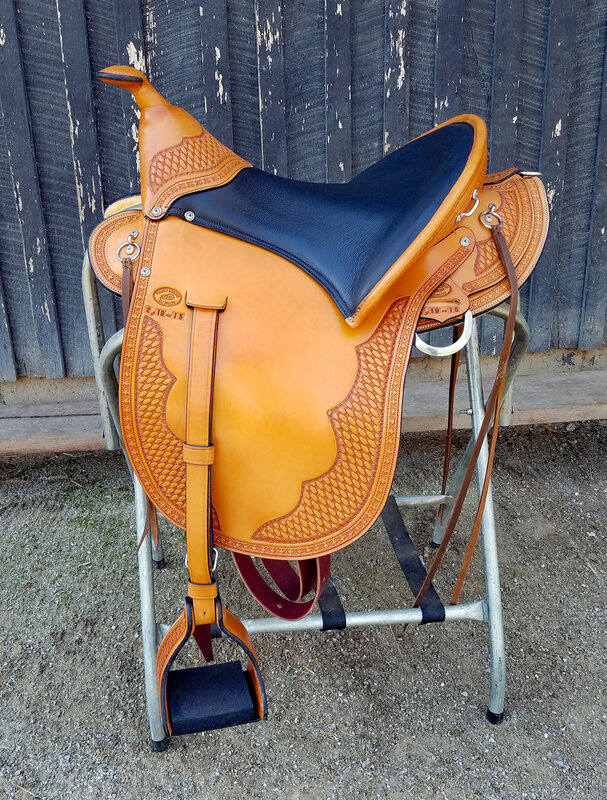 If you are looking for the ultimate comfort while you ride those long trails, you need to check this saddle out. It features an 19 Inch Suspended Seat. 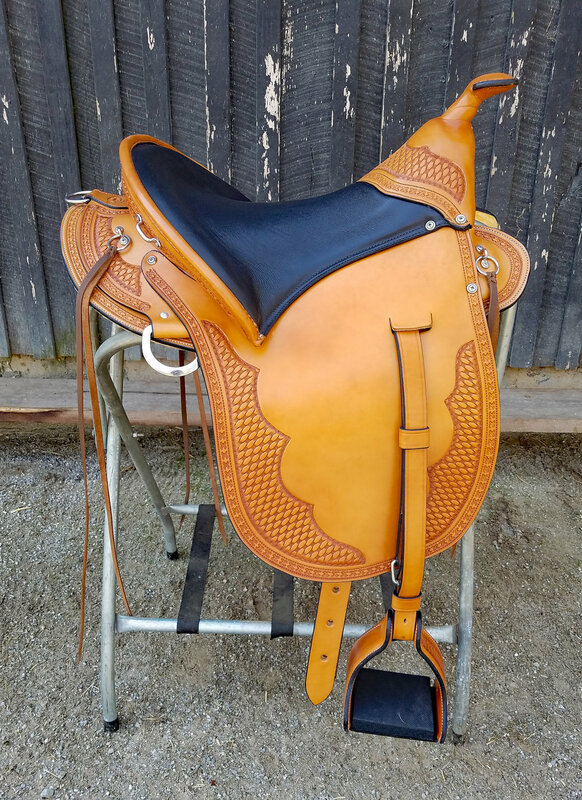 (It is measured like an English Saddle, comparable to a 16 inch in western.) Built on the Buena Vista tree, made for Eli by a local Amish craftsman. 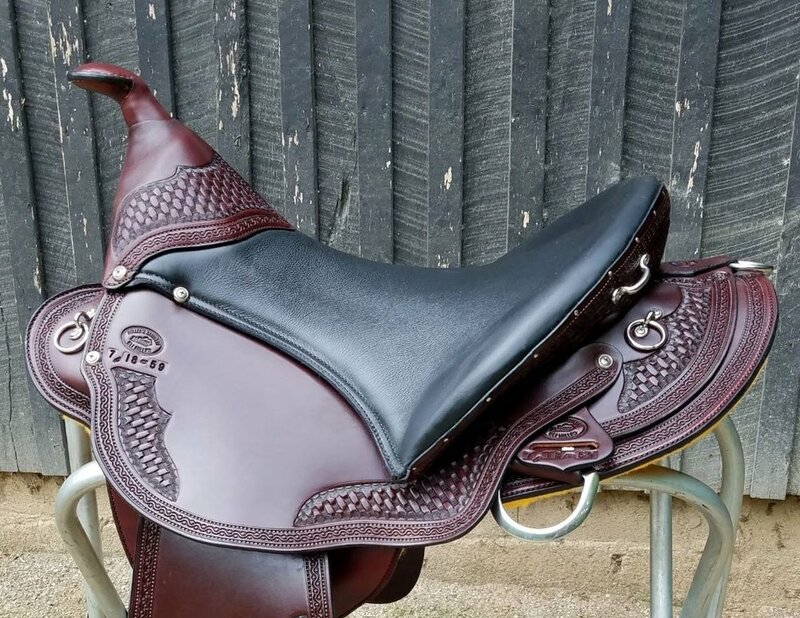 It has a slightly wider gullet and high pommel that is ideal for the high withered, sloping shouldered horses. 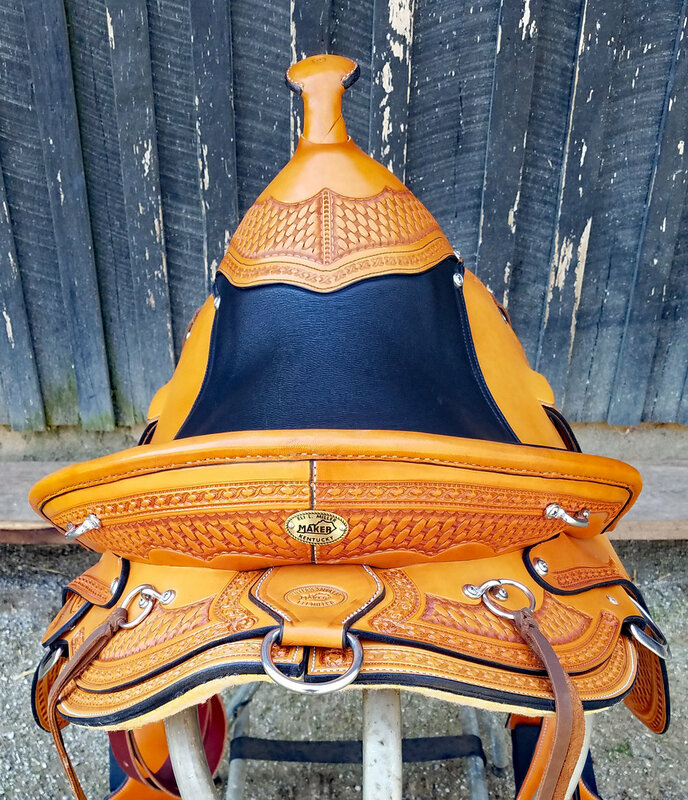 Many gaited horses love this saddle and their smoothness improves considerably. 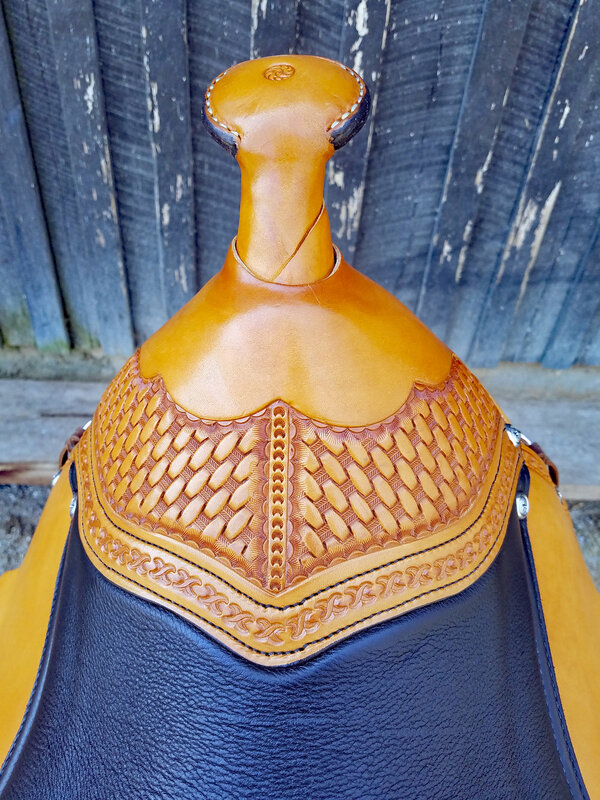 I have also used this on big shouldered QH's and they moved better as well. 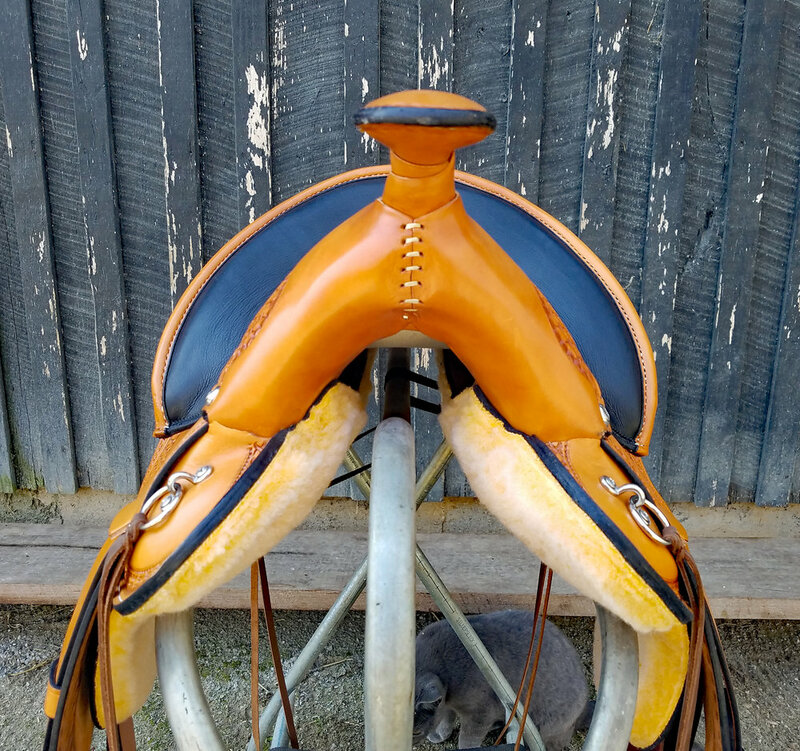 The unique feature of this saddle is the Suspended Seat system. 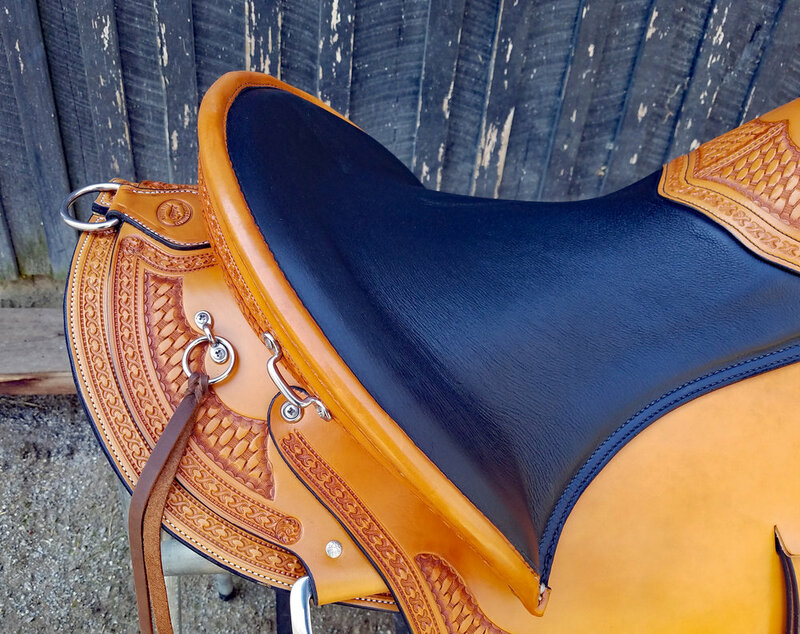 It is what makes the Eli Miller Buena Saddle so darn comfortable. Instead of the traditional "hard seat" on most saddles, this system uses criss crossed webbing to create a suspended "hammock" over the tree. You feel like you are riding on air. No bouncing or jarring. You can still feel the horse but have that added comfort. The padded seat is very roomy and has a lot of clearance up in front and cups it your thighs in the rear. 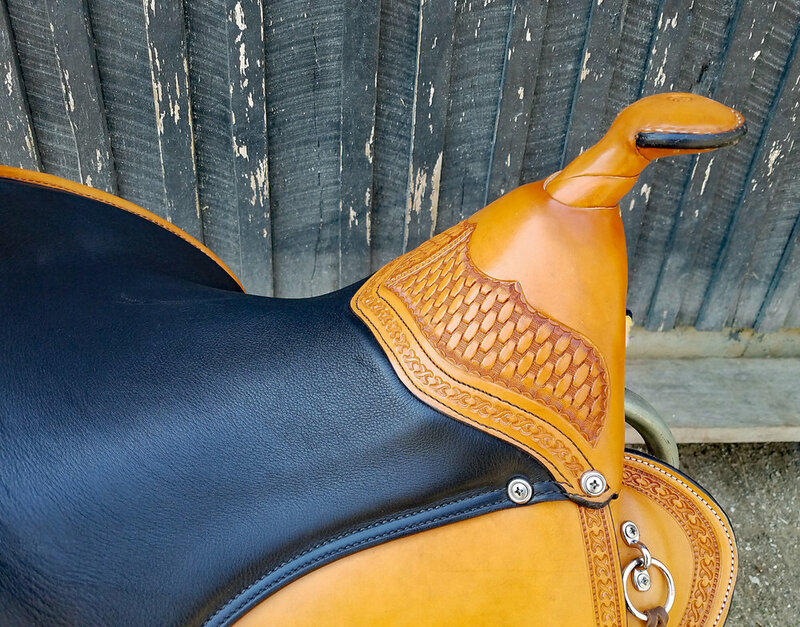 Many trail riders won't ride in anything else after experiencing the comfort of the suspended seat. 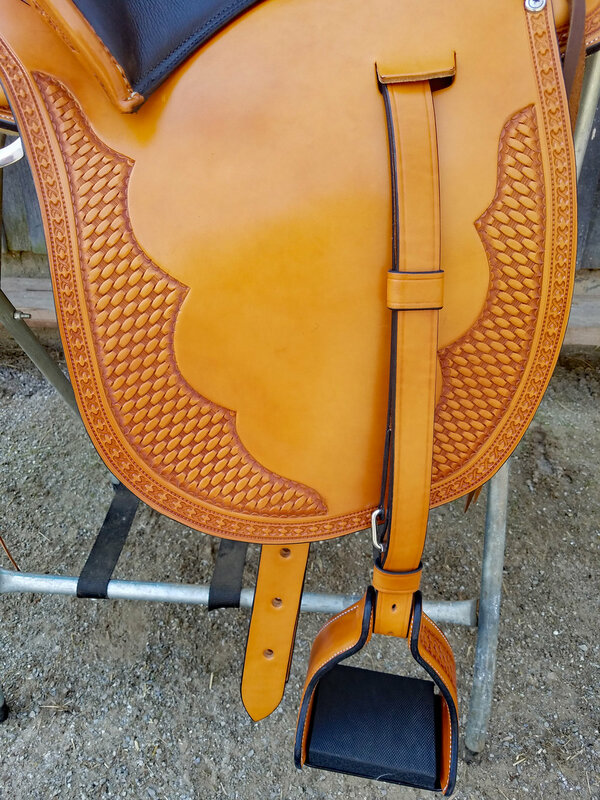 We had this saddle custom made to fit many of our customers needs. The fenders are english style and we added the horn to complete the look. The back rigging is fully functional allowing for better stability on steep hills and rough terrain. You can use both front and rear rings to do centerfire rigging if desired but we prefer a separate front and rear cinch for our hills. The heavy yet supple, Pecan colored leather is made in the USA by Wickett and Craig. It is hand tooled with Eli's beautiful artwork. 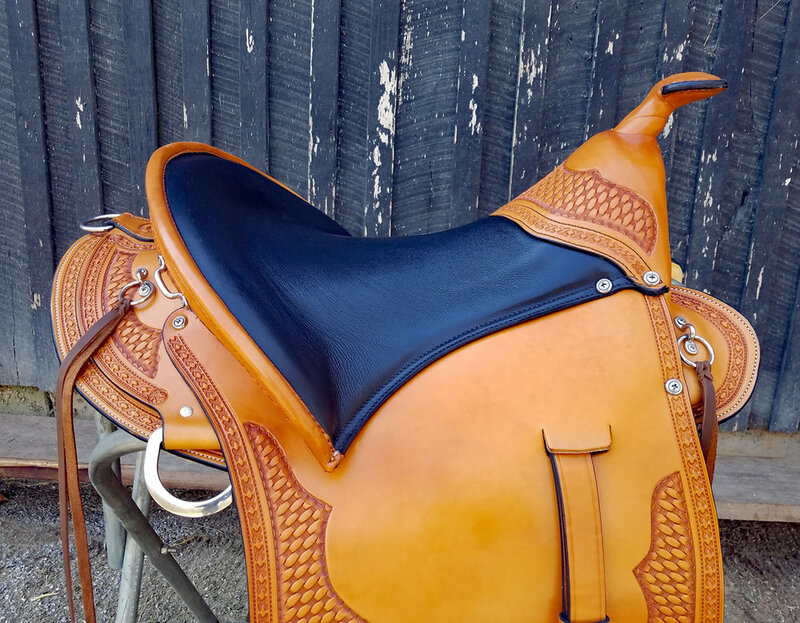 This saddle has plenty of stainless steel hardware for all your saddlebags and equipment. 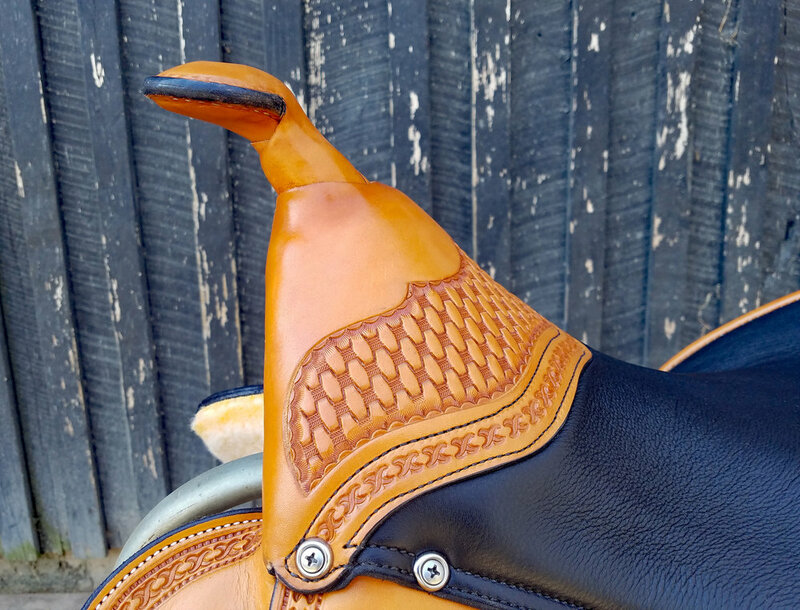 Comfort, wide tread stirrups to ease the knees on those long, multi day rides, complete the package.